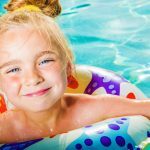 When it’s time to accessorize your new in-ground swimming pool with your very own waterslide, you may be surprised and even a tad overwhelmed by the many options on the market! Before you start shopping, you may want to consider a few specifics to help narrow your search. 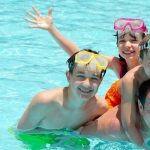 Then, we figured it might also help to take a look at some of the top-rated residential waterslides on the market this year. While the first two slides we’ve reviewed are made by S.R. Smith, these next two are made by Inter-Fab. Each slide has its own set of pros and cons, and only you can decide which one best fits your unique needs, preferences, and poolside space. The Complete Adrenaline Pool Slide from Inter-Fab is currently the largest freestanding residential waterslide on the market. With a height of 10 feet, 1 inch and flume length of 16 feet, 8 inches, it certainly earns its name! The 300-pound capacity makes it appropriate for most adults, and the pre-launch splash zone adds an extra fun factor. Like the Typhoon, the Complete Adrenaline Pool Slide is safe for use in salt pools. 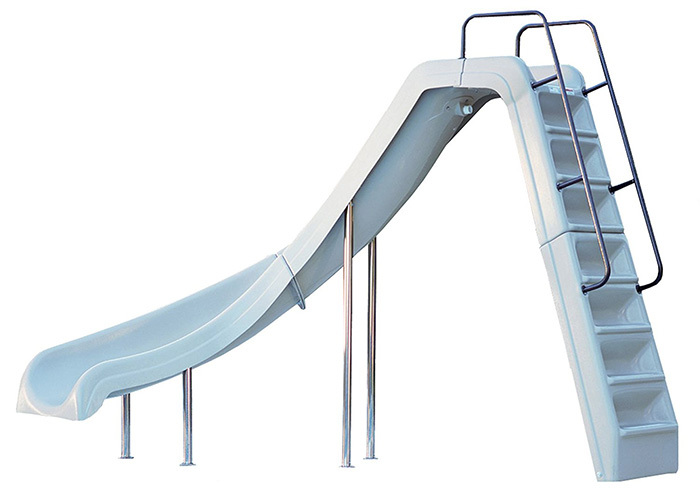 This pool slide comes in your choice of Desert Tan or Summit Gray finish as well as a Left Turn or Right Turn design. The slide appears as if it’s made from ceramic, offering a sleek-looking design. The slide’s structure offers a remarkable degree of comfort. 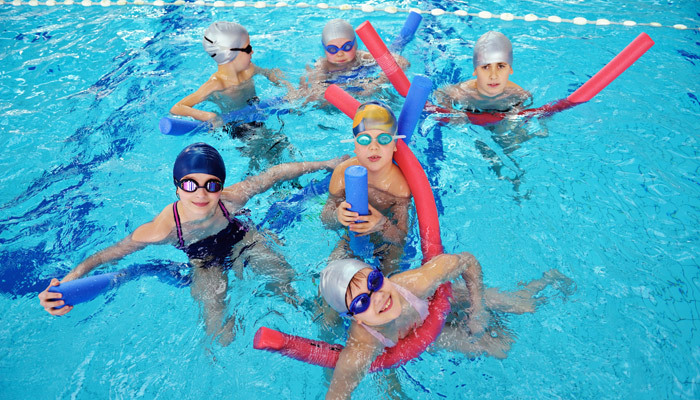 The Complete Adrenaline is expected to take 2 hours for assembly and will require continuous water flow of between 15 and 25 gallons per minute. 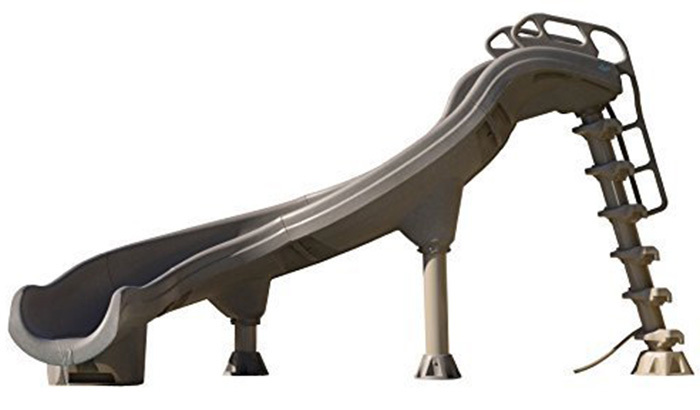 The high tensile strength makes this slide especially durable and able to hold up even in harsher climates. The footprint requires a 15 foot by 8 foot area. Like the Typhoon, this slide comes with a 3-year warranty. As you might expect, its larger size and added durability comes with a higher price tag — but, really, that’s the biggest down side. We think Inter-Fab did an excellent job with the Complete Adrenaline Slide! The Wild Ride Water Pool Slide by Inter-Fab stands 6 feet, 5 inches high. With an 11-foot flume length and 250-pound capacity, it will certainly be able to be enjoyed by both children and adults. Grip-around handrails and enclosed stairs provide added safety, and the high-flow Zoom Flume water delivery system is both efficient and eco-friendly. With the Wild Ride Slide, you can choose from Left or Right designs as well as four different color options: Blue, White, Tan, and Gray. While the Wild Ride does come with a quick and easy setup (thanks, in part to the installation video available from Inter-Fab), you will need to enlist a second person’s help for installation as well as hire an electrician for water-pump setup.